In fairness we were lucky to get nil. I was a bit concerned prior to going to Mansfield due to the predicted weather forecasts threatening a big freeze - snow drifts and treacherous driving conditions. 'Stay at home unless your journey is necessary' yelled one headline from the national press. How come we get the weather forecasts so spectacularly wrong in this country? Nonetheless my mate and I set off for Nottinghamshire and despite the incessant rain we had a very pleasant journey down to Mansfield home of ...er, mmm... Mansfield, and getting parked up quite near to the ground. This was my second ever trip to Field Mill and it was a good eighteen years since I was last here. 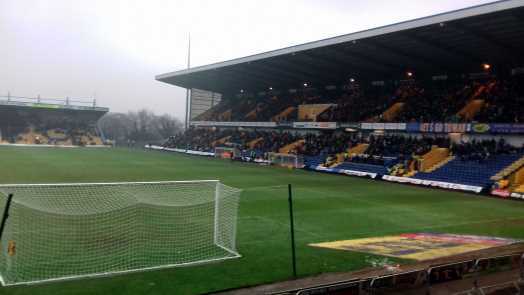 My first visit to Mansfield made a lasting impression on me, that was until I had been to Luton - Mansfield was probably the worst town that I had ever visited in Britain. I am sure on the 'Welcome to Mansfield' roadside sign it had had the legend 'Twinned with Chernobyl' written on it. Their fans on that occasion seemed a bit Leeds-like (Neanderthal was the word I was looking for but Leeds is easier to spell), throwing bottles and glasses at Pools supporters who in fairness reciprocated in the local pub that we were in at the time. I must admit that since my last visit the surrounding area had improved greatly, albeit with retail parks and shopping malls rather than any worthwhile architecture, but improved it has. With an hour or so to kill before kick off we asked a passing Stags fan where was the best place to get some liquid refreshment, and he told us to steer clear of the local pub down the road as, in his own words it was "full of lunatics and Karokee", and suggested that we would be better off at the supporters' club at the ground and as such we took his advice. The place was heaving and it was several degrees warmer than a sauna, no wonder they were selling so much beer. Then the Leeds syndrome kicked in. A passing Poolie negotiating his way back to his seat from the bar with his pint, said politely 'Excuse me' to this big unit and squeezed past him. 'Who are you pushing?' came the retort. 'I did say excuse me.' 'There's no room for me to move'. (If he'd lost a few clem a bus would have got past him). 'I did say excuse me' which I backed him up with. 'There's no room'. Fortunately this unit's son told his six-foot- odd Dad/Grandad to calm down. I feared it would kick off a fight between two pensioners that would have been a first in my book. I felt like saying something to the Big Ape myself but a combination of not getting involved, why bother and cowardice got the better of me. I wouldn't mind but this clown must have been near sixty year old and was looking for some chew and being awkward for awkward's sake. When I think on, the last couple of occasions when Mansfield have turned up at the Vic they have had a nasty streak about them. Small town mentality chip on their shoulder I guess. Fortunately these 'Chorbers' are a declining spiecies. It took an age to gain entry into the ground as the humourless stewards were virtually strip-searching the away fans as they accessed to the turnstiles. The ground itself has changed beyond all recognition since I was here last, watching Peter Beardsley getting subbed early in the second half and being afforded a standing ovation from the Mansfield fans as he left the pitch, not for his performance on the day, which was poor, but because of his being who he was and that he had once played for England. If my memory serves me correctly that was his last game in a Pools shirt. Northampton / Donny etc. Nowadays the away end is behind the goal and good views, as well as excellent Bovril were to be had. When I was last here in 1998/99 season the away fans were housed in the stand at the side of the ground, which is still there ...and boarded up. I have seen some strange stands at football grounds in my time: the stand behind the stand at Fleetwood (or it could be the stand in front of the stand at Fleetwood), the double glazing showrooms / conservatories at Luton, and no stands at all at Donny's old Bell Vue ground. But a boarded-up stand I have never seen the like of before. It genuinely looked like a pigeon loft. I also recall that the stand on the other side of the ground had a roof on it that looked like a giant upturned barge *. I wondered at the time was this where Noah beached his ark and the animals left two by two ...directly to the Mansfield supporters' club for something to 'chew' on. "It was at that stage that I actually considered walking out of the ground and heading off home"
From the start you could tell it was going to be another tough away encounter as the majority of Mansfield players towered over their Hartlepool counterparts. 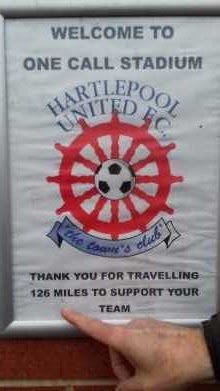 Taking nothing away from Mansfield they were far and away the better team but Pools made them look like world beaters. All four goals came from errors of their own making by Pools, basic schoolboy / girl errors in fact. Harrison got skinned for pace. Cross came in. Bates did not react. Back of the net. Bates caught in possession, a cardinal sin for someone of his so-called Premiership pedigree, allowing their winger to go one-on-one with Bartlett. Back of the net. Mansfield forward runs at Pools' midfield. Turned Walker as if he wasn't there ...he wasn't there all afternoon, if truth be known. Bangs 25 yard shot which to my mind Barlett should have tipped round the post / saved as a matter of course. Back of the net. Mansfield winger flies down the left wing totally unchallenged. Cross comes in. Unmarked and unchallenged, centre forward heads it from distance. Again, Barlett should have done better but same result. Back of the net. Once again, barring Amond, who came off injured, no fight, no bottle. Featherstone and Walker might as well have stayed at home. The former is permanetly stuck in reverse gear. Awful performance from the midfield. Any time Pools got possession they promptly gave the ball back to Mansfield. Bates and Harrison had horror show games; their lack of pace is alarming. The worst bit was when Pools gained a corner. It was taken short by Walker (?) and instead of passing to his team mate a few feet away he promptly passed it to a Mansfield player who then tear-arsed down the wing with it. You could not make it up. It was at that stage that I actually considered walking out of the ground and heading off home. Instead I reminisced on the enjoyable cup of Bovril that I had had earlier. Should I have another? Then I got to wondering when was the last time that I had previously had a Bovril. Ayresome Park was the answer. Then I moved on to the economics of it all. That if it cost £2 for a Bovril and £2.50 for a bottle of Heineken at Mansfield, the profit margin on the Bovril (and tea for that matter) compared to what is been made on the bottle of lager must be absolutely colossal. Whilst these thoughts were going through my mind Mansfield scored their fourth goal. I had previously been forewarned not to leave my car in the club's car park as apart from the £5 charge it is a nightmare to get out of. Nightmare is not the word I would have used. Total utter anarchy would be more appropriate. Vehicles strewn all over the shop and I am sure that there were cars still stuck in here from the previous home match trying to get out. We merried our way back up North and stopped off at Wetherby at the Whaler for fish and chips, a portion of curry and some scraps, which were absolute lush. In order to shelter from the incessant rain and keep our Haddocks dry (Oo err missus), we took shelter in a pub doorway and got chatting to a lad from a Tyneside rugby club whose coach (bus not trainer!) had stopped off on their way home to catch the England - Wales six nations match on TV. We had a bit of banter with him which was in total contrast to that 'k--b' that we encountered in Mansfield's supporters club earlier in the day. I actually told him in all honesty that if I had my time over again that I would in all likelihood follow the egg chasing sport rather than football. Different type of people and values. To sum up. An all-round rotten day, only saved by the Bovril and fish and chips, and in truth the majority of people we encountered in Mansfield were just fine. Also sadly in truth, Dave Jones will have his work cut out keeping this shower in League Two. * In fact that old stand referred to was second-hand, having previously been at the Hurst Park Racecourse until its closure in 1962, and always looked oddly huge at Field Mill. Ed.